Freeride inspired, the Bell Variant Helmet has a round, compact design and great ventilation. 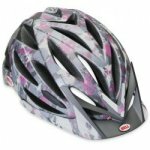 Ideal for all-day trail and endurance riders who are looking for that perfect stealth helmet. Large vents with deep internal channelling provide all the cool air you will need, Fusion In-Mould microshell with upper and lower hard body mouldings that are fused to the inner liner to provide all over strength and protection, Painted VPV visor to keep the sun and rain out of your eyes, Plush and comfortable padding absorbs sweat and can be removed for cleaning, one-handed adjustment for minor tweaking on the move, combining style and performance with great value for money, Meets CE EN1078 certification.